I don't know about you, but I'm just itching for spring. Hopefully we won't have to hold on for too much longer, after all, the groundhog did declare an early end to winter! But in the meantime, I'm getting my fix by incorporating sweet candy hues into my everyday looks. I mean...wearing pastels makes spring arrive quicker, right? RIGHT?! Here's how to make them work when there's still snow on the ground. A great statement coat is a total game-changer in the world of fashion. Especially during these chilly days of winter, an exciting topper will have you looking fresh and stylish - anything to stand out amongst an endless sea of black, right? And this lavender number is stunning. Its striking color makes me feel happy just looking at it, and it surprisingly goes well with many items in my wardrobe. To make such a bright shade of purple work in February, I paired it with not just any basic hues, THE basic hue - BLACK! Black totally grounds this spectacular shade and allows it to take center stage while also making it clear that yes, I do know it's still 30 degrees outside. Since I'm rocking the monochromatic look underneath my fab coat, I knew it was best to switch up textures - thus my no-fail leather leggings came into the picture! To give an outfit more depth when you're relying on similar colors or shades, incorporate pieces with different textures and materials. Leather definitely serves to break up the one-hue overload. There's a party on my feet! How fun are these glittery flats? I feel like Cinderella but much more comfortable because when you're running around the city, who has time for a heel? I'm a big believer in beanies. I mean, who isn't a proponent of staying warm when it's frigid outside? Wearing a hat is a stylish way of doing just that. I don't discriminate either, I wear beanies with EVERYTHING from blazers to pencil skirts. A pop of leopard is just what a minimalist outfit like this craves. Plus, the warm pattern makes this look even MORE winter-appropriate. Rawr! This Alexis Bittar piece is just as stunning as my coat. It matches it almost perfectly, which helps blend my lavender topper into my black pieces. The whimsical bauble is one of my ultimate favorites - what's even more special is that I got it in Boston with my family. Notice how my coat, necklace, and eyeshadow all match? Lavender is SUCH a pretty, feminine color, and I wanted to subtly incorporate it into as much of my look as I could. I was a bit reluctant to layer purple eyeshadow on my lids at first, I mean, I'm not in middle school anymore, but it turned out really lovely. I used Kat Von D's Innerstellar eyeshadow palette and the pigmentation of all of her shadows really impressed me. A look like this was a great choice for exploring the city with my dad. 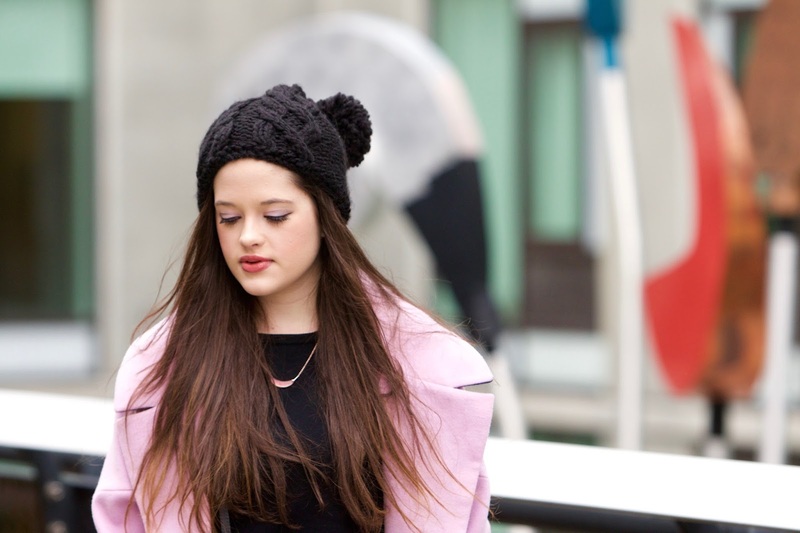 I wanted to stay warm while looking chic, and I have to say, this outfit was perfect! It was also super easy to create and wear. We took this series on The High Line in Chelsea - he had never been before - and I love how everything turned out. The High Line, and Chelsea in general, is an amazing place to shoot and just an amazing place to be. With New York Fashion Week in full swing, there was so much fashion and so much energy! Aw I am sorry about yours and your dads sickness! Prayers for you you both and what a lovely outfit! That coat is absolutely stunning! I love the bright colour and the oversized fit! You look so chic! I love the mix of feminine and edgy. Fabulous coat! Doll,you look adorable! Love girly colors and sparcle you got on your outfit,adorable! This look is very chic, great post. The colour of this coat is so amazing, and I love the leather leggings with it! Cute coat! Love that lavender! Oh I am loving the pastel with edginess of the leather leggings and the pop of bling someone is feeling springy! Stunning outfit!!! The shoes and coat are so pretty!!! WOW this is sweetness VS wildness. 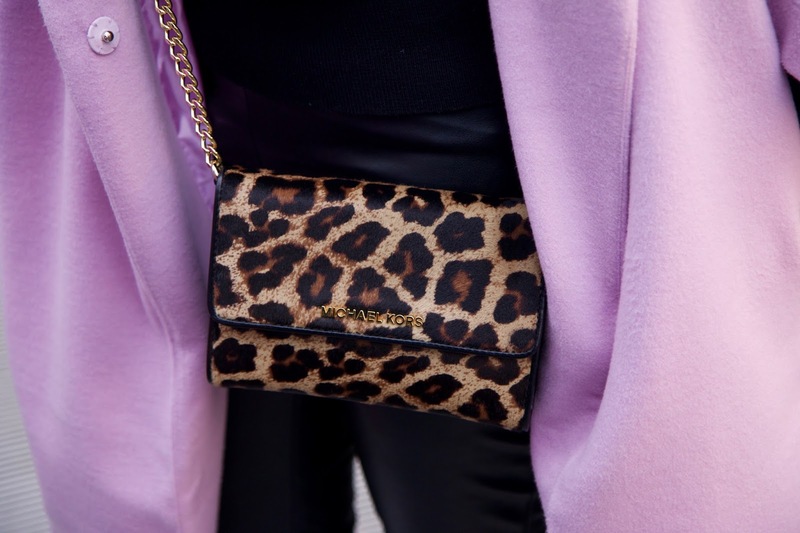 love how you blend the pastel lavender coat with the bold leopard prints on the bag :) Thanks for sharing. wow, I love this look and you look amazing! I'm going crazy with your pink coat, lovely flats too!!! Love this! Such a fun colored coat. Perfect girly contrast to your leather. Your shoes are the cutest!!! You look beautiful, so cozy and chic! Love the coat, and those flats are too cute! You look so stunning! The color of your coat is perfect - brightens up any winter day! Never thought lavender and leather look so awesome! Great outfit! AH!!! 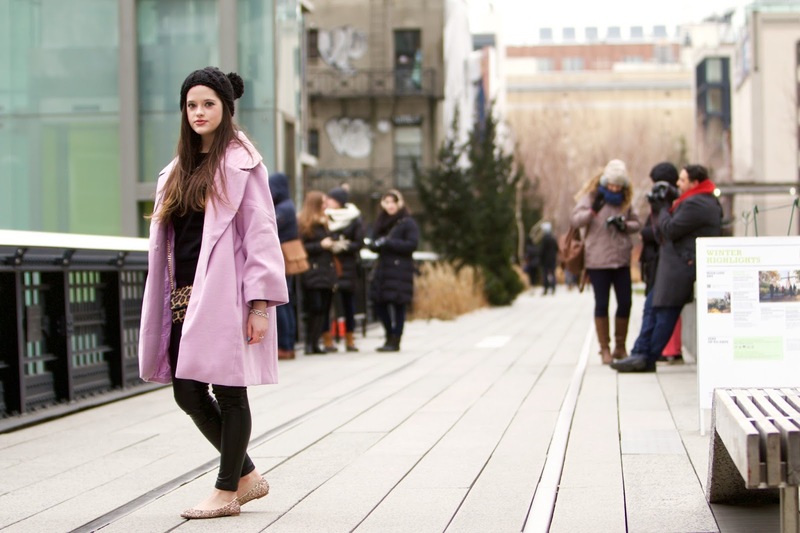 Love thi lavender coat with the sparkly flats!!! >.< You have such an extensive closet! I'd love to see you take a basic 3-ways - like maybe styling a tunic three ways or a coat three ways. :) See you soon on my bloggie!